When the average person thinks of music lectures, what usually comes to mind is some sort of program in “music appreciation,” a term that carries with it nasty visions of pedantic matrons force feeding opera to twelve-year olds. Death to that image, and death to the idea that “concert” music is a sterile old thing best suited to a prissy class of unhip and dusty cognoscenti. Music – the most abstract and sublime of all the arts – is capable of transmitting an unbelievable amount of expressive, historic and even philosophical information to us, provided that our antennas are up and pointed in the right direction. A little education, and by that I mean a single lecture’s worth, goes a long way to vitalizing and rendering relevant a body of music that many feel is beyond their grasp. 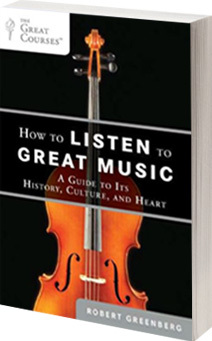 And why should a deeper understanding of music be worthwhile, anyway? I would suggest a few reasons. The skills one brings to listening to music – imagination, abstract thinking, intuition, instinctive reaction and trusting those instincts – continue to be under cultivated in our increasingly sound-bite driven, instant-gratification dominated world. Music, its creation and performance, offers us extraordinary metaphors for issues that we face today on a daily basis: issues like innovation, leadership, teamwork, globalization, and the effects of technology on creativity, to name but a few. Music, as a universal, non-verbal language, allows us to tap into the social, cultural and aesthetic traditions of different cultures and historical eras. We become more aware of our shared humanity and the wisdom and vision of others. Music allows us to transcend our own world, and partake in utterly different realities. Last but certainly not least, music is fun to listen to, relatively inexpensive to partake in, we can do it by ourselves or with others, and there are any number of ways to expand our knowledge and appreciation of the art. Music offers us a marvelous manna, an opportunity to experience the sublime. Rest, relaxation, metaphor and mind expansion at the some time. Cheaper than therapy and when consumed responsibly, safer than Scotch. Irresistible.